Having spent most of his teenage years adventuring in Middle Earth, the author is an avid fantasy fan. His first allegorical fantasy title, "The King of the Trees," came out in 1998 (WinePress). Bowing to reader demand, he has expanded the series to include a total of seven titles to date, with more to follow. While still in high school, he began his writing career editing his father's popular identification guides, "Edible and Poisonous Plants of the Western/Eastern States." As an Assistant Professor in the Special Education Department at Western Oregon University, he served as a successful grant-writer and program coordinator. Burt holds a B.S. in English from Lewis and Clark College and an M.S. from Western Oregon University in Deaf Education. In addition to writing books, he works as an RID-certified American Sign Language interpreter with over thirty years' experience. His interests include reading, foreign languages and mycology. He is married with two grown children. 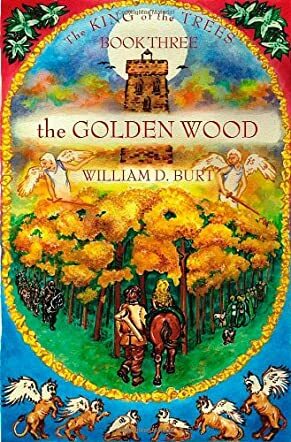 The Golden Wood (The King of the Trees, 3) by William D. Burt is the third book of the series. King Rolin and Queen Marlin are forced into exile. With their companions, they set out to discover the secrets of the fabled golden forests from the griffins. They must also ask for help from the Wood Folk, an ancient race. The book, like the previous two books, is filled with adventure, mystery, and fantasy. The whimsy element always attracts readers because it provides a surreal and ethereal feel to the story and its descriptions. The author has created a new world for children filled with tree-men, owl-faced griffins, and has made Lucambra an enchanted area. Adventure and fantasy stories go well together and always attract readers. The creativity of the author is reflected in the characters, the places, and the descriptions. The story has a Christian theme and message for readers. Books with a message and a moral are always good for young readers because they always manage to make an impact. It is not only a book for children because adults can enjoy this adventure/fantasy tale as well. The rhymes, the simple song at the end, and the black and white sketches add to the charm of the book.